S&P500 (ESM18) The resistance level was broken on the Daily timeframe on Tuesday, the trend is bullish now and the impulse wave develops. A pullback buying opportunity will appear after the correction formation on the Daily timeframe. Long positions will remain relevant until the market is above the nearest support level on the Daily timeframe, the lows of May 29 - 30. ***Dollar Index (DXU18) The market remains in the uptrend and the correction wave develops. A pullback buying opportunity will appear after the correction completion on the Daily timeframe. Long positions will remain relevant until the market is above the nearest support level on the Daily timeframe, the lows of May 11 - 15. **EUR (E6U18) The resistance level was broken on the Daily timeframe on Wednesday, the trend is bullish now and the impulse wave develops. A pullback buying opportunity will appear after the correction formation on the Daily timeframe. Long positions will remain relevant until the market is above the nearest support level on the Daily timeframe, the lows of May 29 - 30. **CHF (S6U18) USDCHF currency pair remains in the downtrend and the impulse wave develops. A pullback selling opportunity will appear after the correction formation on the Daily timeframe. Short positions will remain relevant until the market is below the nearest resistance level on the Daily timeframe, the highs of May 15 - 18. **GBP (B6U18) GBPUSD currency pair remains in the downtrend, the correction came to an end last week and the pullback selling opportunity was formed. Short positions will remain relevant until the market is below the nearest resistance level on the Daily timeframe, the highs of June 7 - 8. **JPY (J6U18) USDJPY currency pair remains in the downtrend, the correction came to an end last week and the pullback selling opportunity was formed. Short positions will remain relevant until the market is below the nearest resistance level on the Daily timeframe, the highs of June 6 - 8. ***WTI (CLN18) The market remains in the downtrend and the correction wave develops. A pullback selling opportunity will appear after the correction completion on the Daily timeframe. Short positions will remain relevant until the market is below the nearest resistance level on the Daily timeframe, the highs of May 30 - June 1. **CAD (D6U18) USDCAD currency pair remains in the uptrend and the correction wave develops. A pullback buying opportunity will appear after the correction completion on the Daily timeframe. Long positions will remain relevant until the market is above the nearest support level on the Daily timeframe, the lows of May 30 - June 5. **XAU (GCQ18) The market remains in the downtrend and the correction wave develops. A pullback selling opportunity will appear after its completion. Short positions will remain relevant until the market is below the nearest resistance level on the Daily timeframe, the highs of May 29 - June 1. ***XAG (SIN18) The resistance level was broken on the Daily timeframe on Thursday, the trend is bullish now and the impulse wave develops. A pullback buying opportunity will appear after the correction formation on the Daily timeframe. Long positions will remain relevant until the market is above the nearest support level on the Daily timeframe, the lows of May 29 - 30. ***AUD (A6U18) AUDUSD currency pair remains in the uptrend. Another high was broken on the Daily timeframe last week and the correction wave develops. A pullback buying opportunity will appear after its completion. Long positions will remain relevant until the market is above the nearest support level on the Daily timeframe, the lows of May 29 - 30. ***NZD (N6U18) NZDUSD currency pair remains in the uptrend and the impulse wave develops. A pullback buying opportunity will appear after the correction formation on the Daily timeframe. Long positions will remain relevant until the market is above the nearest support level on the Daily timeframe, the lows of May 29 - 30. (R6U18) USDRUB currency pair remains in the uptrend. The correction came to an end last week and the pullback buying opportunity was formed. Long positions will remain relevant until the market is above the nearest support level on the Daily timeframe, the lows of June 6 - 8. The resistance level was broken on the Daily timeframe on Tuesday, the trend is bullish now and the impulse wave develops. A pullback buying opportunity will appear after the correction formation on the Daily timeframe. Long positions will remain relevant until the market is above the nearest support level on the Daily timeframe, the lows of May 29 – 30. COT indicator increased but didn’t reverse. CFTC reports indicate that large speculators go on selling and the professionals’ opinion doesn’t correspond to the market technical picture and it makes sense to reduce the position size when an entry point appears in the trend direction. The market remains in the uptrend and the correction wave develops. A pullback buying opportunity will appear after the correction completion on the Daily timeframe. Long positions will remain relevant until the market is above the nearest support level on the Daily timeframe, the lows of May 11 – 15. The resistance level was broken on the Daily timeframe on Wednesday, the trend is bullish now and the impulse wave develops. A pullback buying opportunity will appear after the correction formation on the Daily timeframe. Long positions will remain relevant until the market is above the nearest support level on the Daily timeframe, the lows of May 29 – 30. USDCHF currency pair remains in the downtrend and the impulse wave develops. A pullback selling opportunity will appear after the correction formation on the Daily timeframe. Short positions will remain relevant until the market is below the nearest resistance level on the Daily timeframe, the highs of May 15 – 18. COT indicator increased but didn’t reverse, large speculators are selling franc and the professionals’ opinion doesn’t correspond to the Daily trend direction and it makes sense to reduce the position size when an entry point appears in the trend direction. GBPUSD currency pair remains in the downtrend, the correction came to an end last week and the pullback selling opportunity was formed. Short positions will remain relevant until the market is below the nearest resistance level on the Daily timeframe, the highs of June 7 – 8. COT indicator decreased but didn’t reverse. CFTC reports indicate that large speculators are buying Pound and the professionals’ opinion doesn’t correspond to the Daily trend direction and it makes sense to reduce the position size when an entry point appears in the trend direction. USDJPY currency pair remains in the downtrend, the correction came to an end last week and the pullback selling opportunity was formed. Short positions will remain relevant until the market is below the nearest resistance level on the Daily timeframe, the highs of June 6 – 8. COT indicator increased but didn’t reverse, large speculators are selling Yen and the professionals’ opinion doesn’t correspond to the Daily trend direction and it makes sense to reduce the position size when an entry point appears in the trend direction. The market remains in the downtrend and the correction wave develops. A pullback selling opportunity will appear after the correction completion on the Daily timeframe. Short positions will remain relevant until the market is below the nearest resistance level on the Daily timeframe, the highs of May 30 – June 1. COT net position indicator decreases. Large speculators are selling oil. Professionals’ opinion corresponds to the Daily trend direction. WTI Crude Oil (CLN18). Technical analysis and COT net position indicator. USDCAD currency pair remains in the uptrend and the correction wave develops. A pullback buying opportunity will appear after the correction completion on the Daily timeframe. Long positions will remain relevant until the market is above the nearest support level on the Daily timeframe, the lows of May 30 – June 5. The market remains in the downtrend and the correction wave develops. A pullback selling opportunity will appear after its completion. Short positions will remain relevant until the market is below the nearest resistance level on the Daily timeframe, the highs of May 29 – June 1. COT indicator decreased but didn’t reverse. 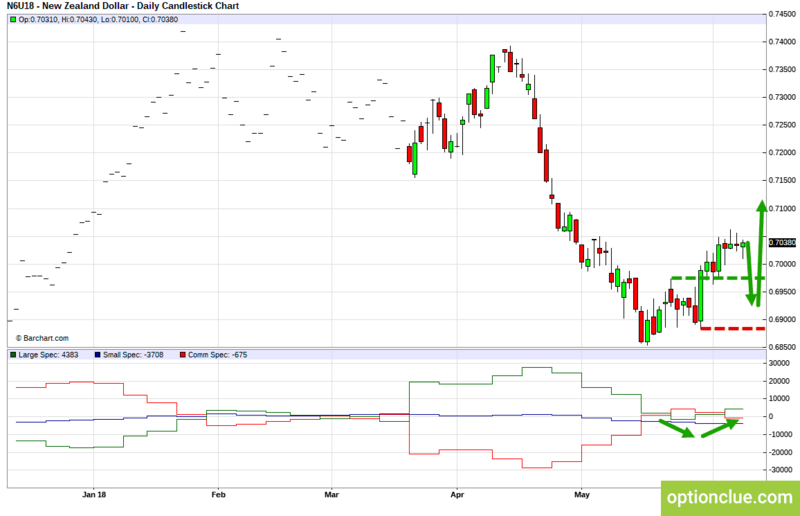 Large speculators are buying gold and the professionals’ opinion doesn’t correspond to the technical picture and it makes sense to reduce the position size when an entry point appears in the trend direction. The resistance level was broken on the Daily timeframe on Thursday, the trend is bullish now and the impulse wave develops. A pullback buying opportunity will appear after the correction formation on the Daily timeframe. Long positions will remain relevant until the market is above the nearest support level on the Daily timeframe, the lows of May 29 – 30. AUDUSD currency pair remains in the uptrend. Another high was broken on the Daily timeframe last week and the correction wave develops. A pullback buying opportunity will appear after its completion. Long positions will remain relevant until the market is above the nearest support level on the Daily timeframe, the lows of May 29 – 30. COT net position indicator reversed. Large speculators began to buy and hedgers are selling. Professionals’ opinion corresponds to the Daily trend direction. NZDUSD currency pair remains in the uptrend and the impulse wave develops. A pullback buying opportunity will appear after the correction formation on the Daily timeframe. Long positions will remain relevant until the market is above the nearest support level on the Daily timeframe, the lows of May 29 – 30. COT indicator reversed. CFTC reports indicate that large speculators began to buy and the professionals’ opinion corresponds to the market technical picture. USDRUB currency pair remains in the uptrend. The correction came to an end last week and the pullback buying opportunity was formed. Long positions will remain relevant until the market is above the nearest support level on the Daily timeframe, the lows of June 6 – 8. COT indicator increases, large speculators are buying rouble and the professionals’ opinion doesn’t correspond to the Daily trend direction. In terms of medium-term trading, financial instruments with the correction close to completion on the Daily timeframe and with potentially the most promising risk-reward ratio are Dollar Index, GBPUSD and EURAUD. In the near future AUDUSD, NZDUSD and EURUSD can become noteworthy depending on the market correction depth.